Leader in children’s programming Marilyn Olin finds her true calling in print. With a fascination and appreciation for the minds of children, Marilyn Olin created programs like Alex and Annie in 1978 and continued her work as the Vice President of Children’s Programming at ABC Network until her departure in 1991. Since then, Olin and her husband have indulged in their passion for world travel, splitting time between New York and Paris. 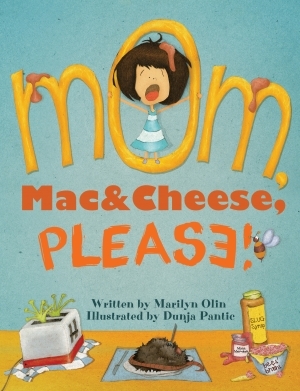 To pursue another lifelong love, Olin published her first book Mom, Mac & Cheese, Please! (Sky Pony Press) in October 2013. Q: What was the appeal of child-adolescent entertainment for you? A: I think you have to go back to when you were a child and ask, ‘What is it that I love doing?’ I think more people should do that if they can rather than just growing up and going to a job. In fourth grade, I was writing. A lot of kids are taught to do this or do that, and they lose it — that childlike fascination, excitement, imagination — because you have to grow up, and I don’t think you always have to grow up much. You have to be in touch with yourself. I love talking to kids. I adore talking to kids. I think they’re wonderful. And, at an exhibit of Picasso, [the audio tour mentioned] something that really stuck in my mind, and I loved it. Picasso said: ‘I really started to paint well when, again, I started to paint like a child.’ And I love that because we put constraints on children with what’s right, what’s wrong; but I adore their mind. They are in the here and now so much more than we are. I think if we can retain some of that, I think it’s great. I’ve always loved children’s projects. I’ve always thought very child-like. When I was at my job at ABC, I remember waking up in the morning and thinking, I’m getting paid for what I love to do! I think that’s one of the best joys in life when you can work at something you really love. Q: What are some of the most memorable moments from your time in television? A: Getting great ratings was very memorable. When I was there, you would get your ratings in every week and see how you did against the other networks. Now, there are so many channels; but at the time, there was CBS, ABC, and NBC. That was very exciting to see. I had some of the highest awards in children’s programming. We put on the first Spiderman, even before the movies, and Richie Rich; and they were all really fun shows to do. I didn’t create it, but I continued to work with the producers on Scooby Doo at that time, and a lot of other shows. On Schoolhouse Rock, Lynn Ahrens was a dear friend of mine. In fact, at one point, she and I had a production company together, and we produced things, including Alex and Annie. It was so much fun working with her. The after-school specials were wonderful because I would get letters in from parents saying how wonderful they were and how it taught them, their teenagers, and pre-teenagers so much about life. There was a psychologist who would read the letters that kids sent in [to Alex and Annie]. She taught me a lot about kids, too. At the Daytime Emmys, my children’s department won 16 out of 28 Emmys given one year — this was the soap operas, the game shows, and the talk shows, plus children’s programming. So that was fun, too! Q: What was it like to leave that position? A: I loved the job. But, you know, it was a different life. I left there when [my husband and I] started living in Paris. It was time for another chapter in my life. We both love travel. We’ve been to Cambodia, Laos, Africa, India. We rented an apartment here [in Paris] for one year, about 22 years ago. But we keep going back and forth. It’s a great education, it really is, to travel. I think it’s the best education in the world. You get to meet different people, experience different cultures, and I think that’s very stimulating for creativity. And now I’m doing another chapter with the children’s books! Q: How did you come to write Mom, Mac & Cheese, Please!? A: I wasn’t intending to, then there was a little boy in a restaurant. He was eating fried feet. I made up a poem: ‘Can you believe I’m in a fog because you’re eating the French-fried feet of a frog?’ And the boy kept repeating it, and that’s where I started writing the book. I saw that children love the repetition and the rhyming. Then I found a terrific illustrator, and we’re having just such a great time. And we have a wonderful agent. Her name is Jane Lahr. She’s just fabulous, and I also love the fact that she is the daughter of Bert Lahr, who played the Cowardly Lion in the Wizard of Oz. A: The other books that I’ve written [not yet published]...all have these nice little messages for kids. [Mom, Mac & Cheese, Please!] is just fun and silly for kids, but the other things that we’re working on are books with a little message for kids. They’re kind of cute, and I’m hoping some of those will get out, too. One of my books may have a character in it, I’m thinking of one in particular, which I can’t talk about it, that may go into animation one day. I don’t know! We shall see! Q: What advice would you give to someone who has an idea for a children’s book? A: First, you have to sit down and write it, not just think about it. Don’t think, just do! That’s one of my ideas in life. If it’s something that you want to do, just make time and do it. The other thing is, don’t think about rejection. That’s the hardest thing. You have to have faith in yourself. Look up some publishers that will take unsolicited books. But there are also ways to do it on the Internet if you want. And a lot of people do that, too. Some people go through an agent, but that’s very hard. First, just write the book. The thing is, as in television, you have to find people who think the way you do. Find Mom, Mac & Cheese, Please! on Amazon.com.